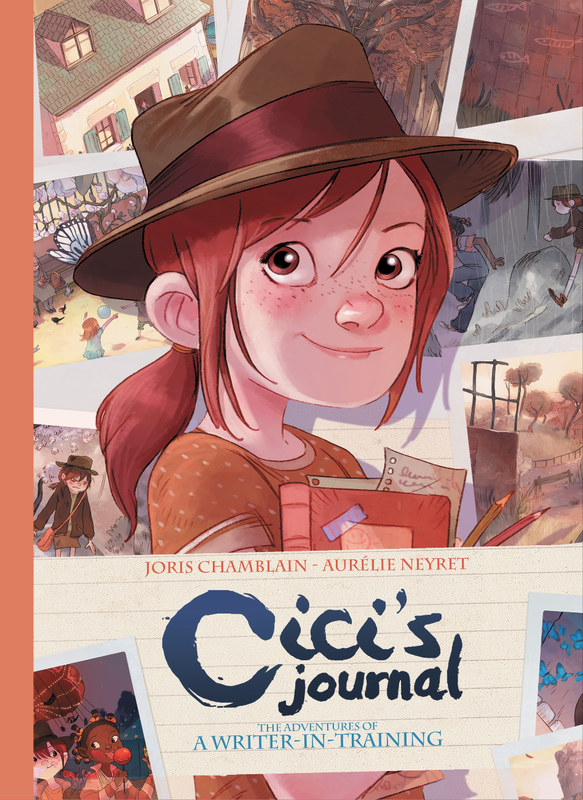 Cici's Journal: The Adventures of a Writer-In-Training by Joris Chamblain and Aurélie Neyret is the complete package! 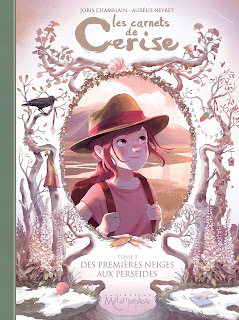 Originally published in France as Les Carnets des Cerise, this is story of a young girl who observes the world around her with the eye of an aspiring writer, presented to readers as her journal. 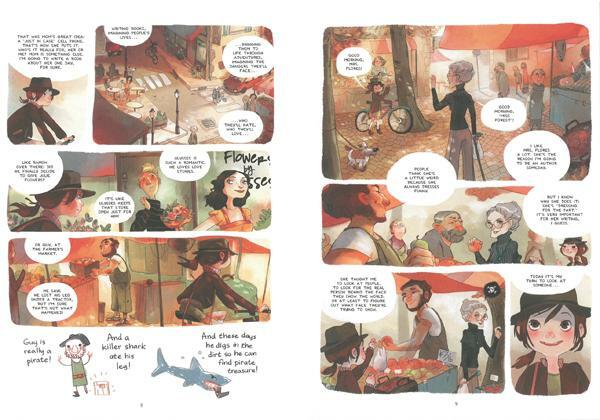 Scrapbook type pages with photos, doodles, mementos and newspaper clippings tucked and taped along the edges are interspersed with pages of traditional graphic novel panels that move the story along. 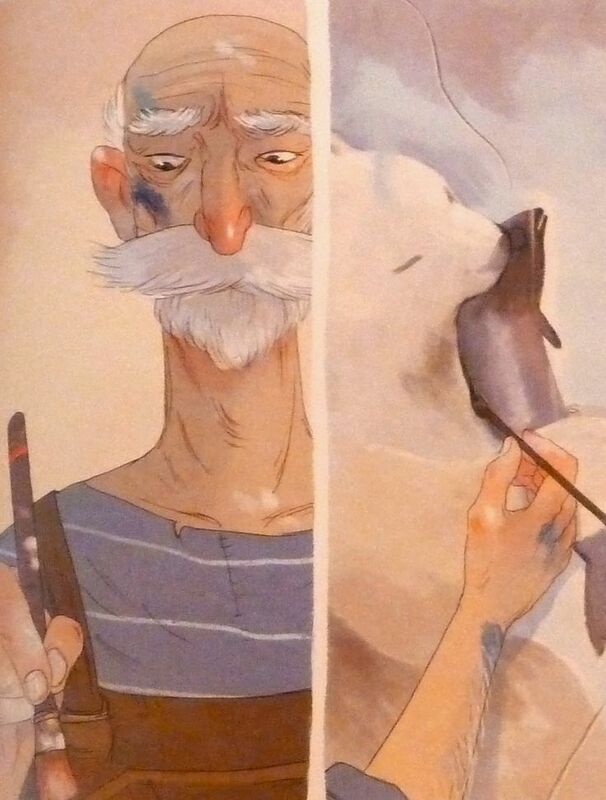 Aurélie Neyret's illustration stye is cinematic and her characters are instantly engaging. 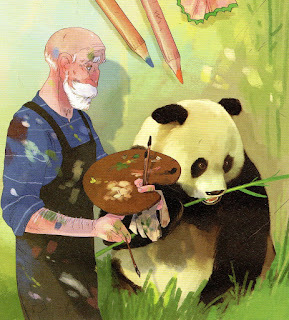 She creates a world that you want to linger in and return to. 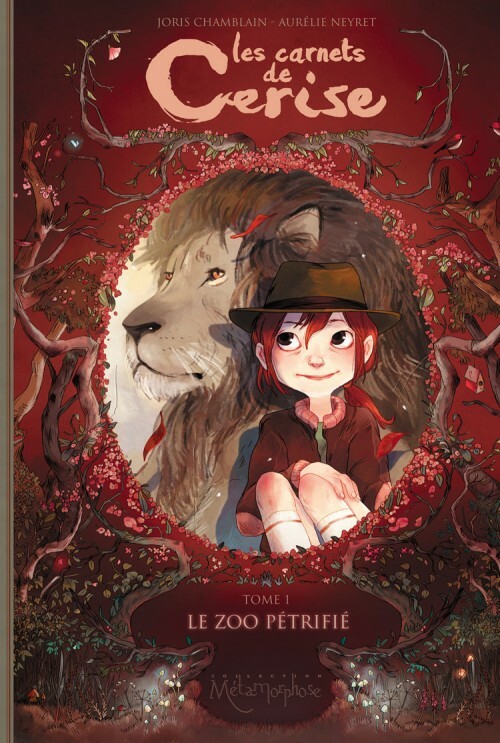 Cici's Journal: The Adventures of a Writer-In-Training represents the first two volumes in this series, Part One: The Petrified Zoo, and Part Two: Hector's Book. 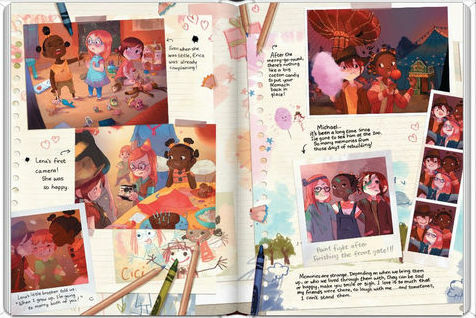 Being a journal, ten and a half year old Cici spends the first pages introducing readers to herself and her world. 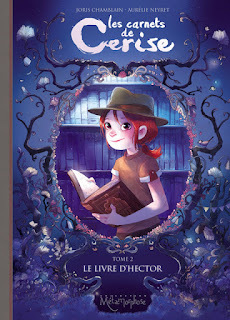 Her dream is to be an author and she loves to observe people and imagine their lives, searching for the secrets they hold that make them who they are. 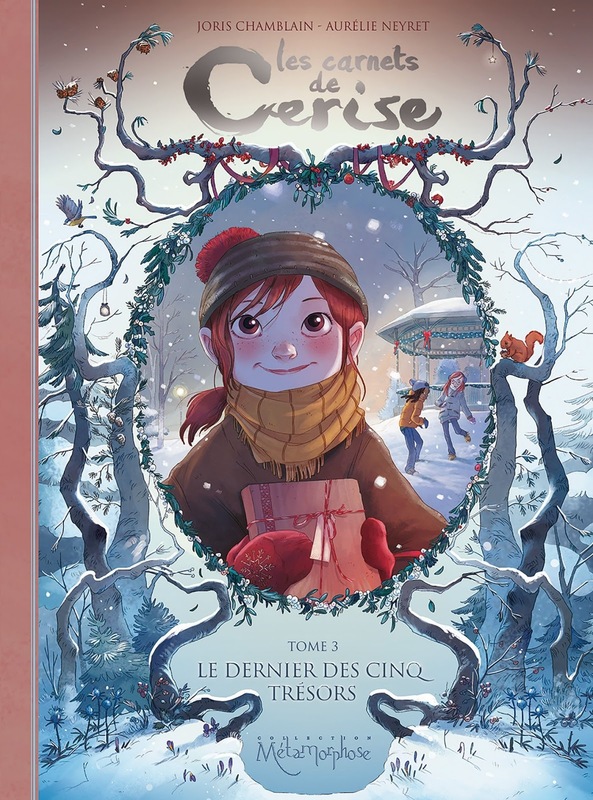 Cici lives with her mother in a small country town where her best friends are Lena and Erica. Annabelle Flores, a famous writer, lives nearby in a huge mansion, all alone. Cici first me Mrs. Flores when she visited her school to read to the students and do writing exercises with them, which Cici loved. Cici spends a lot of time with Mrs. Flores, asking her questions and learning more about writing, but not learning much about Mrs. Flores herself. Knowing people, especially the people in your life, and keeping connections with them strong and healthy, is a theme that runs throughout both parts of Cici's Journal. In Part One: The Petrified Zoo, Cici is intrigued by a man she sees hauling buckets out of the forest where she, Erica and Lena have a treehouse. 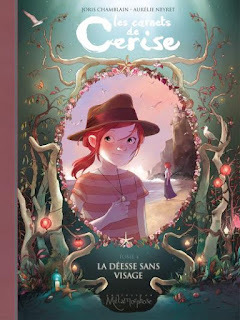 She gathers clues asking questions around town until one day she finds a trail that leads her to him, making a startling, marvelous discovery that she shares with her friends, family and the whole town. In fact, Mrs. Flores even gets the idea for her next book from the discovery! 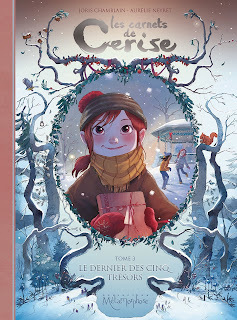 In Part Two: Hector's Book, Cici has a mysterious person she it observing - and elderly woman who leaves her house at the same time every Tuesday. Taking a bus out of town, she returns at the same time as well. When Cici finds a library card dropped by the woman, she learns that she checks the same book out each week, over and over. As Cici pursues this literary mystery, she is not always completely honest with her mother and she neglects her friends. Even worse, she makes Mrs. Flores feel like she only wants to be friends when the old lady has information that will help her with her mysteries. Cici makes an important discovery at the library, but, more importantly, she learns that her mother's trust and Mrs. Flores, Erica and Lena's friendship can't be neglected and that she needs to open up to them and trust them, too. 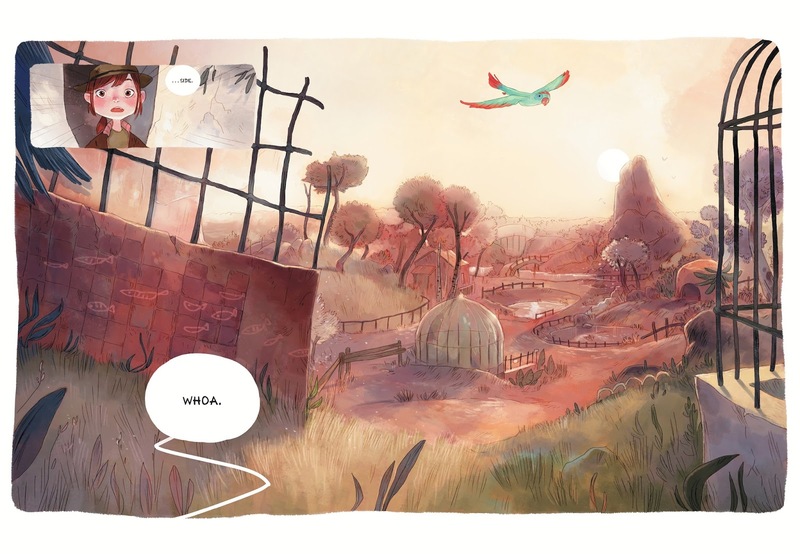 It sounds simplistic the way I describe it here, but it's very moving as played out over the course of the graphic novel and done in a way young readers will grasp. While I can't read French, I am seriously considering purchasing the next three volumes in this series just to drool over the art. I hope that we soon find them published here, in English, because Cici's voice is one I want to hear more of and her adventures are sure to be intriguing!